Mister Vic is co-director of Music Together of Assabet Valley. He has been teaching music to young children for over 17 years. He is known for his energy and enthusiasm and can be spotted around Maynard, Stow, Hudson, and Sudbury wearing his African pants. Mister Vic holds a bachelor's degree in Organizational Behavior from Lesley College. Mister Vic does musical birthday parties as well as teaches private instruction in piano, guitar, brass, and voice to children and adults of all ages in his home studio in Maynard. He especially enjoys working with children who have special needs. Please contact us at 978-897-0874 or at mtofav@gmail.com for more information. Pat is co-director of Music Together of Assabet Valley. She has been teaching classes for over 14 years. In July 2003, she was awarded the Music Together® Certification I designation, recognizing her experience and expertise with the curriculum and completion of advanced level training. She holds a bachelor's degree in Organizational Behavior from Lesley College. Pat is known for her beautiful voice and great class management skills, and the kids love her. She cantors at her church and does musical birthday parties. She can be contacted at 978-897-0874 or at mtofav@gmail.com for more information. Debbie loves to sing and first experienced Music Together as a parent while bringing her two children to classes for many years. She later successfully completed her Music Together Teacher training in 2003. Debbie also has her Bachelor's Degree in Early Childhood Ed and was a pre-school teacher prior to having children. She is involved with local community theater groups and her church choir. 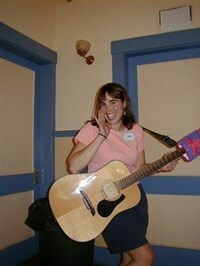 Debbie is a novice guitarist who brings a fresh, warm presence to her classes.